This is without doubt Paul Gallico's most well-known book. It is subtitled A Story of Dunkirk, and it is the story of a lonely hunchbacked artist who lives in an abandoned lighthouse in the marshlands of Essex, and his friendship with a young girl who brings him an injured Canada Snow Goose. It is only a short book - sixty four pages - but it is quite lovely. The story was first published in The Saturday Evening Post in 1940. 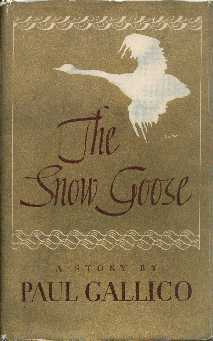 The Snow Goose was one of the O. Henry prize winners in 1941. The story has been the inspiration for music on at least seven occasions. The story was used as the inspiration for an LP by the British rock bank, Camel, in the 1970's. In about 1947, Nat Wolff produced an album of three 78rpm records of music by Victor Young, subtitled A drama with with sound effects and music. It was re-released in the fifties as an LP. An LP of music by Ed Welch was recorded by the London Symphony Orchestra. It was narrated by Spike Milligan and came out in 1976 on the RCA label. The same music was released as a CD in 1990 in Australia, narrated by Ruth Cracknell. According to the CD cover, Ruth Cracknell's voice was mixed separately from the rest of the album - I believe this is the same recording with a new narration track laid over. A UK folk singer, Tom Bliss, has written and recorded a song called God Speed. A composer called Eric Funk has written a one-movement piece for piano and orchestra called Rhayader. A New Zealand composer called John Ritchie has written a short piece for flute and orchestra, called The Snow Goose; he has also written an adaptation of this piece for flute and piano. A composer called Stephen Murray has written a piece for piano trio and narrator, called The Snow Goose. There was also an audio book (which also contained Ludmila and The Small Miracle) on EMI Listen for Pleasure. It was narrated by Sir John Mills, and came out in 1979, and re-released in 1984. It is no longer available, but copies turn up from time to time on eBay. A show called Storm's Child, inspired by the story, was created by Moving World Theatre. It is described as An Exploration in Eurythmy, Dance and Theatre. There has also been a puppet adaptation of the book by John Harvey and The Puppet Lab in Edinburgh, which toured the UK in 2003. A book called The Snow Geese has recently been published by William Fiennes; it is a travel book about the Snow Goose and it's migrations. 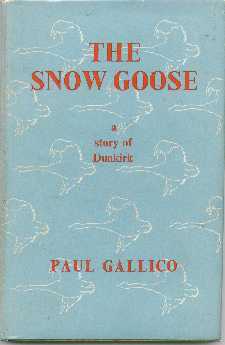 The author was inspired by reading The Snow Goose as a child. The US edition of the hardback is still in print, and has been continuously in that format for sixty years. The UK edition sold over a million copies. Not surprisingly then, second-hand copies of the hardbacks are reasonably easily and cheaply available. First editions are quite scarce, particularly in England - the book was published in wartime. 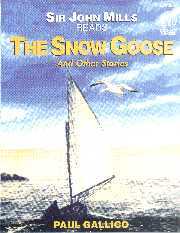 Of course, The Snow Goose is really only a short story, and like most good short stories, it has been anthologized. It can be found in a lovely anthology called Read with me by Thomas Costain, published by Doubleday in the mid-sixties - the stories in here are really very good indeed. It can also be found, of course, in the 1941 collection of O. Henry prize winners. Or just get hold of Selected Stories, Confessions of a Story Writer (but not Further Confessions...), Three Stories, Gallico Magic or The Best of Paul Gallico. There is also an extract from the book in Animal Stories, a collection edited by Michael Morpurgo. Three beautifully illustrated editions of The Snow Goose have been published. The first was published by Michael Joseph in England in 1946. The colour and b/w illustrations are by Peter Scott (now Sir Peter Scott). This is not all that hard to find, especially if you do not want a first edition. This particular edition is also available in a special limited edition of 750 copies, signed by Paul Gallico and Peter Scott. This is very difficult to find - I am the proud possessor of number 3. The second, illustrated by Beth Peck, was published in the States in 1992. It seems to be fairly easy to get hold of a copy - and it is definitely worth having. My copy has a publisher's band around it, saying Celebrating 50 Years (two years late!) and A Classic Illustrated for the First Time. I feel Sir Peter Scott would have something to say about that! The third was recently published by Hutchinson in the UK, and by Knopf in the US. This one is illustrated by Angela Barrett, and is also quite lovely.